Hooke Road Hardtop Insulation Kit: Have a hard top on your Jeep JK Wrangler and find the noise a little too much or is the heat beating you down in the summer? 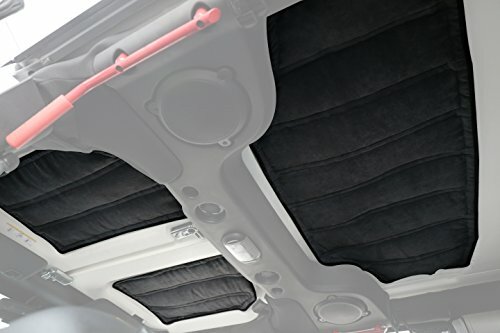 1.This insulation is custom fit for the factory multi-piece hard top and greatly reduces noise inside your vehicle. 2.The special padding material is surrounded by heavy duty pleated nylon providing added interior comfort by insulating the cab from heat and cold to keep your winters warmer and your summers cooler. 3.Durable hook and loop fasteners allows for an easy installation without removing your hard top. 4.Special insulation material surrounded by heavy-duty pleated nylon l insulating cab from heat and cold. 5.Sturdy hook and loop fasteners allow for easy installation. 6.Absorbs sounds to reduce noise inside your vehicle. Hooke Road is a registered US brand.Ian started Hooke Road in 2013. With a background in jeeping for more than 5 years. At Hooke Road our goal is to make your Jeeping experience the absolute best that it could be. The main thing is that we install everything that we sell. Not only are our products used on our very own Jeeps, but we have also tested almost everything that we sell on the road and in the field. If you have any questions about this product by Hooke Road, contact us by completing and submitting the form below. If you are looking for a specif part number, please include it with your message.